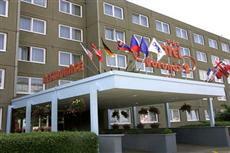 The Orea Hotel Voronez 2 Brno is located near the Brno Fairgrounds. Guests will find the historic Moravia cottage next door to this accommodation in Brno. The Lednice is also located within easy reach. The Orea Hotel Voronez 2 Brno is located in close proximity to the city’s airport. Brno public buses offer easy airport access as well as fast transportation to the many points of interest located throughout the city. Each of the guestrooms at the Orea Hotel Voronez 2 Brno offers wireless Internet access as well as many other amenities. Each room has been recently reconstructed for added guest comfort. All rooms include private bathrooms as well as a comfortable décor. Guests of the Orea Hotel Voronez 2 Brno will find that the fairgrounds offer a large number of trade fairs and shopping options. The hotel offers an array of amenities, including a restaurant and a wine bar. The hotel also offers complimentary breakfast as well as access to a salon, a sauna, and a massage parlor.